This weekend I attended Art Science Camp, put on by Subtle Technologies and the Hart House at University of Toronto. See schedule. I had an awesome time, and met several really cool people. I put on a session on cyborgs and sensory augmentation, where I talked about sensebridge and the stuff I am doing. Plus I put on a session where we did readings, which was a lot of fun. Sadly I didn't take very many photos, but the few that I did take you can see on flickr. At least two other people were also very interested in cyborg stuff, so in addition to my cyborg session there was another, focusing on the social ramifications of transhuman technologies. I also helped Andrew Owen do a hands-on creation of another photo-cubic artwork, using my little Polaroid Pogo Printer. It worked out pretty well actually. 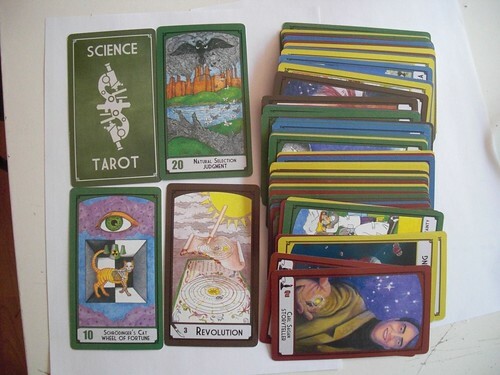 The science tarot stuff was the biggest hit though, it's just such an improbable conjunction of ideas, it makes peoples brains go all funny just to think about it, let alone use it. And the best part is that the cards are beautiful! I brought them to the art science camp because it's clearly "science art". It's more questionable whether it's "art science", although several people did get pretty good readings :-). I inspired a half a dozen people to go buy their own deck! I personally think it's a very interesting way to approach tarot for people who are normally prone to reject such stuff out of hand - and I find the cards speak to me a lot better as well, because they use a metaphor language that I understand (as opposed to the regular tarot, which is often quite esoteric).